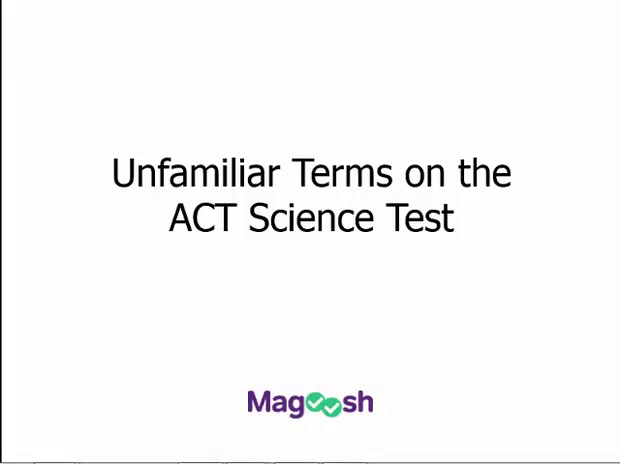 This ACT Science lesson from Magoosh is all about becoming comfortable with uncomfortable situations. In this case, the unfamiliar terms that you are definitely going to be encountering on the ACT Science Test. Everyone, whether you are a science whiz or just one of those regular folks, are going to encounter terms and concepts and units that you're completely unfamiliar with on the ACT Science test. Now all of these terms are going to fall into one of three categories. Either they will be explained in the passage and in that case it's quite probable that you're gonna use them in some way. They won't be explained in the passage but are just part of the extra information the passage includes so that it's not too easy on you to get to the right answer or they won't be explained. They do in fact play a role in the questions, but you don't really need to know what they mean in order to get the right answer and that's what we're gonna focus on today. Most of the questions are going to fall into this third category. So it is incredibly important to learn to be comfortable with the state of being on the ACT Science test. If you get stumped on a question, and feel that there is something more you need to know about that term in order to answer the question, then look for it in the passage, and chances are you are going to find that it is defined there. But don't worry too much about reading and understanding any of the passage until you get to the point of being stumped. Again, most questions you aren't going to need to understand what the strange new term means. So let me go ahead and show you what I mean with an example question. Okay, so let's look at this imaginary question. This is an ACT question in which I've replaced all the actual terms with fake, sciencey sounding words, so the playing field is completely leveled here. Regardless of how much science you know, no one would be able to figure this out based on science knowledge. But without knowing what any of this means, I promise you we can still answer the question and that is because the ACT Science Test is for the most part really all about finding the relevant parts about tables, figures and graphs and looking at the trend in the data. So let's go ahead and tackle this imaginary question together. Based on the data in table one which of the following could possibly be the valcoplitude when the first agrusulator is glommtom and the second agrusulator is hydruticle, given an interepulse of 28? Okay, what? But let's look at the table and see what we can figure out. So if our first agrusulator is glommtom, and the second one is hydruticle, that means we want to be looking at these first three lines here where that matches up with the question and our interepulse is 28. So that means if we're following the trends in interepulse 28 would be right about here. So, that means that our valcoplitude needs to be between 18 and 32. So we can eliminate answer choices a and d. Now, for deciding between 20 and 31, we need to be looking at where 28 would fall between 25 and 45. 28 is a lot closer to 25 than it is to 45. So, I'm gonna guess that the valcoplitude would be closer to 18 than it is to 32, 31 is just way too close to 32 so, our answer would be b 20 sigh. But you don't need to know what that sigh symbol means either. Okay, so our key takeaway here is that, for almost all of the questions you see on the ACT Science test, you don't need to understand the terms and units, you just need to find them. And this is why, I think, that practice has especial importance on the ACT Science test. It's not like the math tests where practicing a bunch of coordinate geometry problems will help you better understand geometry so that you can build confident when you see coordinate geometry problems on the test. On the ACT Science, doing practice problems that you don't understand at all and seeing that you can, still get them right, can help you avoid sheer panic on the test, entirely. It's basically about becoming comfortable with no, not knowing what the heck is going on and knowing that you're going to be okay anyway and that is one of the, most important lessons about the ACT Science test that you can learn.